When you are a food snob like me, baby peas are called “Petit-pois” at my house. I really don’t have a answer as to the why. As far back as I remember that is what my mother called them and well that is how they stuck in my head. 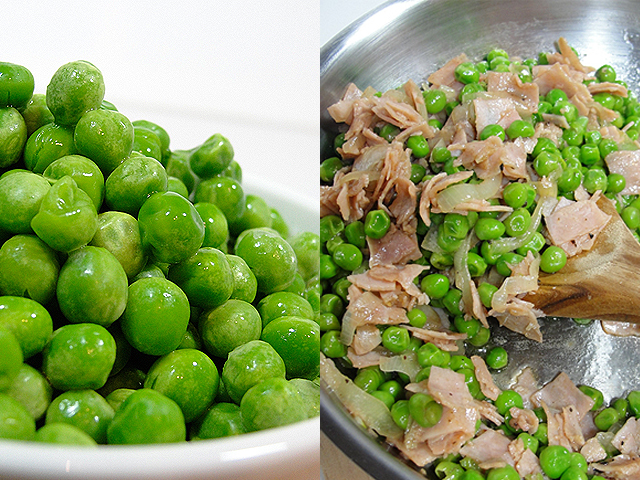 Even when I learned English, when I think of baby peas, I immediately translate them in my head to “Petit-Pois”. But, there is nothing snobbish about the quick, easy way of making this sweet, bright green ingredient. Plus, I always seem to have the needed ingredients on hand. When I need a side to any dish this, this is my sure go-to ingredient. It pairs with everything: Meat, poultry, fish, heck even alone in a bowl! 2 cups of petit-pois (ok, uhm…baby peas!) frozen is good, if you can find them fresh even better! 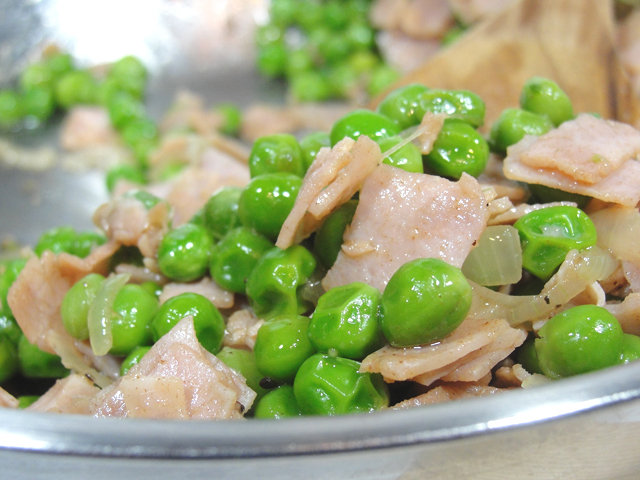 If baby peas are frozen, measure about 2 cups and put aside. In a shallow sauce pan, over medium-high heat, melt the butter. When the butter is bubbling, mix in the onions, season with a bit of salt and cook for about 2 minutes until soft, then mix in the ham/prosciutto (if using prosciutto, go easy on the season moving forward since the prosciutto is cure and a bit salty to begin with). Cook for another 2-3 minutes. Now it’s the baby peas turn. In the pan they go, move them around, season with salt and crack pepper. If the pan seems a bit dry you can add the ¼ cup of water/stock (if needed). Cover, lower the heat to low and simmer for about 3-4 more minutes - I like my peas a bit “al dente” (not mushy) so after the time is up, I taste them, if peas are done, remove from heat and serve.